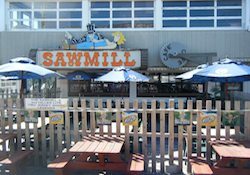 Serving the Jersey Shore since 1977, The Sawmill is home to the famous 27 inch Sawmill pizza. With over 30 beers on tap to choose from, The Sawmill offers the biggest selection of draft and craft in the area. It is also known for its handcrafted crushes and cocktails with fresh squeezed juices.